Trumpeters, altos, and violinists alike, rejoice: we have a heap of field trip options for your big group (or small group) that we are dying to tell you about! 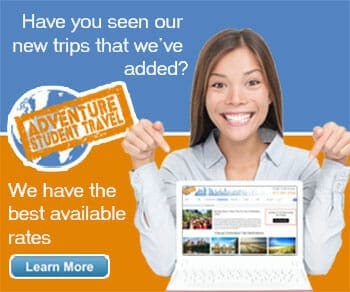 As one of our top-selling student trips here at Adventure Student Travel, we have established numerous connections within the musical performance field and have a very solid handle on the best places, festivals, and cruises to send student performance groups on. These opportunities provide adjudicated, non-adjudicated, and just plain fun travel options that fit a wide variety of group field trip needs! So, band, choir, and orchestra students, are you ready for your big moment? For groups looking to really show off their talent, festivals and competitions are the way to go! Festivals of Music will provide your group with amazingly helpful adjudicated performance opportunities, not to mention really customizable travel options. The festivals take place in several different major locations, some of the most popular being in Chicago, Atlanta, Nashville, New Orleans, New York, D.C., St. Louis, and Toronto. Each event hosted by Festivals of Music boasts remarkable instrumentalists, conductors, and choral members, not to mention well matched and experienced judges for each individual music group. Your experience will begin with a 25-minute warm-up followed by time on stage (30 minutes for choral, 45 minutes for instrumental) that will include commentary covering your performance from a panel of three adjudicators and a post-performance clinic from one of the adjudicators. There are several groups allowed to perform here, such as concert bands, full orchestra, string orchestra, jazz band, parade bands, visual ensembles, concert choir, chamber choir, jazz and show choir, and even renaissance choir. Read more about Festivals of Music. Washington D.C is chock full of fantastic performance opportunities, with over nine different performance venues throughout the entire city (plus all of those landmark educational sites along the way)! Enjoy living history only found in D.C, education throughout the many museums and government establishments, and musical tips left and right! Choose between several different museums and memorials here, some of the most popular playing platforms including the Jefferson Memorial, National Mall, Washington Harbor, Six Flags Over America, and the MLK, Jr. Memorial. If you time your visit just right your group can play in the National Cherry Blossom Parade in the spring (this highly attended parade accepts 10 high school bands to march)! Read more about D.C Performances. Rock The Boat cruises provide talented student groups with top-notch live entertainment, swimming, dancing, karaoke, and of course, performance opportunities. Maybe the most appealing feature of this cruise line is the unforgettable journeys provided to some of the most educational, and beautiful, places around the United States and surrounding tropical areas. Oh, and did we mention the great food involved in each cruise? Performance groups that are welcomed on these cruises include instrumental, vocal, dance, and drama groups. These student groups may choose to perform in a more relaxed, unjudged situation at any of the port of calls along the way, or may also choose an adjudicated onboard performance, critique, and clinic. This option is for serious musicians looking to further their talent through commentary and workshopping. The onboard space is big enough to handle musical groups, corporate events, and various student team building exercises, so you won't’ have to worry about a group ‘too large.’There is truly no better option for students looking for an educational or performance thrill at sea, especially when you take into consideration all the port of call options with this company, including such places as Galveston, Miami, Jacksonville, and New Orleans. Read more about Rock the Boat Cruises. What could be more epic than an opportunity to play at the iconically magical Disney parks in California or Florida? Not much, in our company's opinion! Both Disney parks offer a unique, fun, and truly helpful young musician program by the name of Performing Arts Onstage. This is a great opportunity for your marching band, concert band, choir group, or dance troupe. You will get to perform, participate in various current competitions, sit in on major festivals happening, or take part in professionally guided workshop sessions. The performances are mostly professionally judged, giving you critical teamwork skills, musical fine tuning, all more advanced performing skills! These sessions even meet the standards of the National Core of Arts Standards! The best part? After taking in the performance experience and helpful tips, you can take in the park itself and enjoy your Disney experience. Read more about Disney Performing Arts Onstage. The Universal Studios STARS Program is another really excellent program that allows talented young musicians to perform, learn, and have tons of fun while doing it. Head to Universal Studios Orlando Resort to take part in several different performance group opportunities such as adjudicated and non-adjudicated marching, concert, dance, choir, drum line, and color guard performances.While at Universal you and your group will have the opportunity to hit the stage, the parade route, or any current holiday festivals or events! You will even have a chance to get a "Sound Design" workshop afterward or participate in a professionally adjudicated performance. Enjoy the exciting performance option from Plaza State or City Walk, or if you’re lucky enough to happen be here for the Music USA Festival definitely take part in that! After you strut your stuff on the stages relax and enjoy your time at one of the most popular U.S. theme parks, chock full of opportunities for memorable fun for your entire group (and chaperones!). Ride all the rides, eat all the fun festival food, and see all the exciting sites before you go! Read more about the Universal STARS Program. New York City is a bustling city filled to the brim with educational and exciting performance options for marching bands, music and dance groups, and drama troupes. From the iconic performance venues throughout the Broadway-based city to the epic annual performances such as the Macy’s Thanksgiving Day Parade, this city is truly one of our best performance locations. While in this diverse and energetic city you will be able to sightsee some of the most iconic American attractions, eat some of the most delicious foods, and play in some of the most beautiful venues. The Statue of Liberty is an excellent place to start for performance options, though if you want something more elegant you can also head to Carnegie Hall. Groups can also choose to perform in St. Patrick's beautiful cathedral and at the Lincoln Center! Read more about New York Landmark Performances. Check out the complete collection of our Performance-based travel opportunities on our Performance Theme Tour Page!